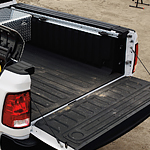 The Ram 2500 has many best-in-class features and can go up to 15,000 miles between oil changes. Built into the 6.7L Turbo Diesel is a smart diesel exhaust brake that automatically works to slow down the engine when needed. Combined with either a manual or automatic six-speed transmission, you can improve the torque load to handle a wide range of job tasks.